Using 3 strands of Sport Weight yarn and size 10 needles cast on 1 stitch. Increase on next row to 3 stitches. TIP: remember to increase on the 2nd stitch at the beginning of the row, and the 2nd to the last stitch at the end of the row for a cleaner edge. Continue knitting till 34 inches long or however long you want. Decrease 2 sts. every K row till only 1 st. is on the needle. TIP: remember to use the 2nd stitch at the beginning, and 2nd to last at the end of the row. Cut yarns and pull through. Cut 2 sets of 10 inch strands of each color and tie onto each end. TIP: Put all three balls into a zip lock plastic bag. Zip it closed then cut a triangle in the bottom corner. Pull the 3 strands out together. 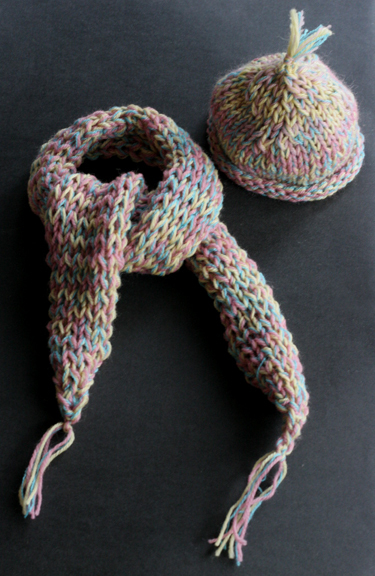 This will keep the yarns from twisting and tangling as you are knitting. If you want to make an adult scarf just adjust the number of stitches to the width you want it and keep knitting till you're happy with the length. Using the same 3 yarns and a size 6 circular needle cast on 42 sts. Start decreasing. Every 18 sts. on first row, 16 on second row, 14 on third row, etc. till there are 6 or 8 sts. on the needle. TIP: make your decreases all lean the same direction. Either K 2 tog. or K1, Slip 1, PSSO. Cut yarn about 6" and with a large eye needle pull that yarn through to close. For optional tassel cut a few strands of each color about 2 ½ inchesl. Pull them through the center and wrap a few times around to secure. TIP: If you want a larger hat cast on a few more stitches.